Women are statistically more likely to vote for the Labour Party than the Tories. Some 28 percent of mothers with children under 18 plan to vote Conservative, compared with 48 percent who favor Labour. Three months ahead of the 2015 general election, Cameron has evidently tried to woo female voters by polishing his “family man” image. 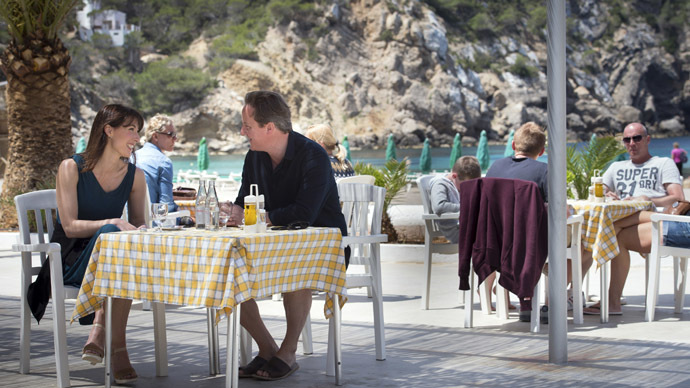 In an interview with Woman & Home magazine, the PM heaped praise on his wife Samantha Cameron. “It is true that behind every man there is a great woman,” said love-struck Dave. The PM confessed that Sam Cam chooses his clothes for him, adding “she has extremely good taste. @Independent that's up there withe the pink bus!!! “I love cooking, it’s a very good way to get your mind off things,” he told the magazine. Cameron's done an interview with "Women & Home" magazine where he describes himself as an "optimistic and fun guy". Sorry if you're eating. Fun-guy Dave’s interview was skewered by social media users, branding it a “patronizing” election tactic – worse than Labour’s now infamous pink bus. Others accused Cameron of stereotyping women in this interview. @Independent yes, cooking. And makeup. And highlighting anything pink will REALLY appeal. Because that's what we all are.One big stereotype. “Yes, cooking. And makeup. And highlighting anything pink will REALLY appeal. Because that’s what we all are. One big stereotype,” one Twitter user spat.